Length 16 ft., beam 6 ft. 2-1/2 in., draft 12 in., total height 4 ft. 9 in., weight 6 cwt. 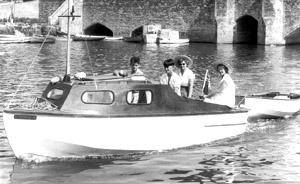 Fitted in the 8 ft. long cabin of this double-chine cabin cruiser are two bunks, with sitting headroom. There is plenty of storage space below the bunks and in lockers, and there is provision for a chemical toilet and a cooker. A sliding roof adds comfort and convenience. The outboard motor well is surrounded by decking with locker space beneath. The stern seat can be widened to take an air bed and there is room for two more air beds on the cockpit floor. The plans also include instructions for building an 18 ft. version. A 4 H.P. motor is sufficiently powerful for canals and rivers, 10 H.P. is recommended for tidal waters. The hull has double-chine form, giving a performance close to that of a round bottomed boat, while having the simplicity which comes from using plywood sheets. Nomad is built upside down on frames. POWER 4 - 10 H.P.